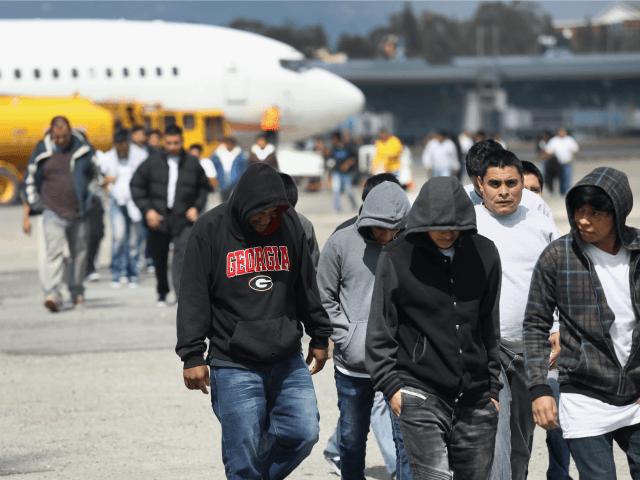 Officials working for President Donald Trump have begun repatriating some of the 81,000 illegal immigrants who were quietly given “administrative closure” quasi-amnesties by officials working for former President Barack Obama, according to Reuters. From January 2012 until Trump’s inauguration in January, the Department of Homeland Security quietly dropped deportation cases against 81,000 illegals who were deemed not be criminally dangerous, despite their illegal status in the United States and their harmful impact on Americans’ ability to find well-paying jobs. That policy was part of a broader political push to open many legal doors for foreign migrants, including economic migrants from Central American, refugees from Syria, and migrants from Islamic countries, and “parolees” from the population of illegal immigrants in the United States. In 2013 and 2014, Obama also pushed hard for the unpopular “Gang of Eight” bill that would have amnestied all illegals and also doubled the annual inflow of legal immigrants. Obama’s “administrative closure” quasi-amnesty did not provide the illegals with green cards but did allow them to continue working and searching for a legal route toward residency and a green card. Trump ended that lenient policy on January 25, by requiring DHS officers to consider all illegals as candidates for repatriation. Trump formally ended that lenient policy on January 25, by saying DHS officers should consider all illegals as candidates for repatriation. The Reuters article shows that Trump’s reversal policy is sending home some of the “administrative closure” illegals. Trump’s renewed emphasis on immigration will be a help for millions of Americans as they search for well-paid jobs in an economy deliberately flooded by the U.S. government with cheap immigrant labor. Each year, four million young Americans begin looking for the well-paid jobs that they need to get married and raise a family. But the federal government annually adds roughly 1 million immigrants and one million temporary foreign contract workers to the labor market, which already contains roughly 8 million employed illegal immigrants. The population of illegal immigrants was topped up in 2016 by the arrival of roughly 550,000 illegals who either crossed the border or refused to leave when their tourist and work visas expired. That flood of foreign labor reduces Americans’ salaries and wages by roughly $500 billion per year, much to the advantage of company owners and investors, according to a Harvard researcher. However, Trump’s decision to reverse “administrative closure” is only a small portion of the labor supply problem. There’s no evidence that all 81,000 of the protected illegals will be required to return home, and Trump’s deputies are also continuing the DACA quasi-amnesty which provides work permits to roughly 765,000 people who claim they were brought across the border as children by their parents. There is little evidence that Trump’s deputies are increasing legal pressure on employers who hire illegals, such as meatpackers, construction companies or restaurants, and Trump’s officials have not yet begin to shrink the annual inflow of one million contract workers, such as the H-1B white-collar workers and H-2B blue-collar workers. Still, Trump and his deputies have sharply reduced the inflow of illegal immigrants over the border, have established bureaucratic curbs on the 110,000-a-year H-1B program, and appear to oppose congressional efforts to further expand the annual inflow of roughly 110,000 H-2B blue-collar seasonal workers. Trump is also curbing the inflow of refugees and is setting rules that pressure immigrants to integrate into U.S. society. Nonetheless, Trump’s pro-America policies are far more favorable than were the policies pushed by Obama and presidential candidate Hillary Clinton, both of whom championed policies which sharply increased the inflow of foreign workers.